This trail starts on the highway shoulder just after the emergency management center on the right. The climb is very rocky and technical for several miles before it levels off some. Near the top of the canyon, the singletrack turns left and drops into the canyon bottom, then descends back down to the highway. Near the bottom there is a short hike a bike section and then some smooth singletrack to the end. 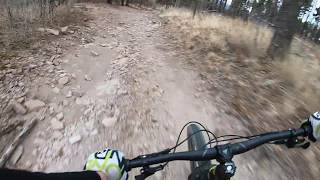 Nail Trail descent, Los Alamos, NM.